This entry was posted in Uncategorized and tagged Africa, fabric, Food Water Shelter, handmade, kitenge, mamas, sewing, skirt, Tanzania, workshops on May 14, 2012 by Rebecca McQueen. 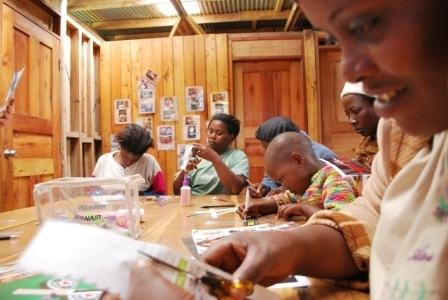 Thanks to the generosity of friends and family for donating the supplies needed and/or cash for craft stuff, I have recently been lucky enough to host three craft workshop afternoons at Kesho Leo, an eco-friendly children’s village run by foodwatershelter.org.au, just outside Arusha, Tanzania. 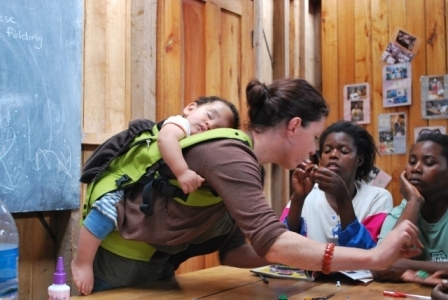 I volunteered with fws for the year 2009, and it was so wonderful to be back to see the mamas and kids again. 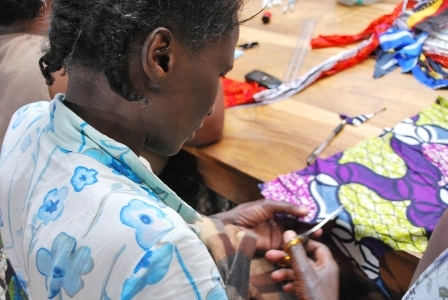 The mamas have learned to sew since being employed as live-in house mamas at Kesho Leo, and have been making bags and purses for the past couple of years which they sell in town. I decided to give them something a bit different to do, something which I was hoping would spark some creative interest and make use of otherwise wasted materials. Before I left I got googling, and found a lot of different things to make with recycled magazine paper. I felt this would fit in well with fws values, as there is no paper recycling facility available in the area so this paper would otherwise go to the local dump and be burned. Why not make something beautiful with it instead? We started with paper beads, a tutorial I found here. These are quite simple to make, and you would never know they are made from paper.. and they make gorgeous unique necklaces! 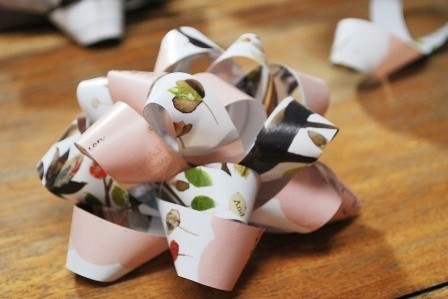 Next thing we did was make some beautiful gift bows. One brightly coloured magazine page makes one bow, and I thought they would be a hit at the Arusha Christmas fair this year. Another Christmas themed project we made were tiny origami “lucky stars”, which can be strung together to make a garland. 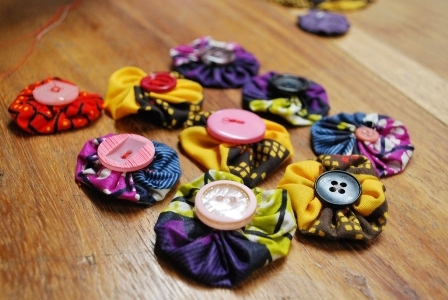 Lastly we used scraps of fabric and spare buttons to make some fabric yoyos. Some fabric scraps are too small to use for anything, and a project like this is a great way to use them, and also for developing fiddly hand-sewing skills. As with everything in Africa, these projects took a lot longer to teach than I expected so unfortunately I didn’t get to the other craft projects I wanted to show the mamas. On my list were paper bowls and coaster sets, patchwork (for bags, cushions and purses), baby bibs and nappy covers. Oh well, there’s always next time I guess! This entry was posted in Uncategorized and tagged Africa, Arusha, craft, Food Water Shelter, handmade, Kesho Leo, sewing, Tanzania, workshops on October 30, 2011 by Rebecca McQueen.